At the request of the editorial board, Archpriest Serafim Gan, chancellor of the ROCOR Synod of Bishops, Secretary to the First Hierarch of the Russian Church Abroad, commented on the latest decisions of Patriarch Bartholomew and assessed the actions of the Phanar. 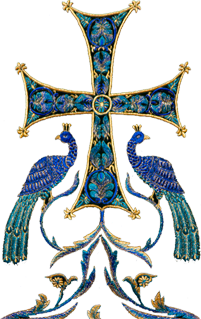 During the spring, a great relic was brought from the Synodal Cathedral of the Sign in New York City to St. Elizabeth Convent in Minsk, Belarus: a reliquary with the right arm of the Holy Nun-Martyr Grand Duchess Elizabeth Feodorovna, and a piece of the relics of Nun-Martyr Barbara. It has been my particular honor to create a magnificent shrine and reliquary for the Russian Royal Martyrs. 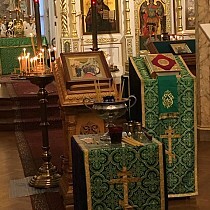 The shrine was commissioned by an American convert to Orthodoxy as a gift to the Hermitage of the Holy Cross, a Russian Orthodox monastery in Wayne, WV. On Monday, January 8, as part of his broader ROCOR Studies project, Deacon Andrei Psarev (assistant professor of Russian Church History and Canon Law at Holy Trinity Seminary in Jordanville, NY) visited St. John the Baptist Cathedral in Washington, DC, where he conducted an interview with its rector, Archpriest Victor Potapov. Baptized at 25 years of age in Kiev, after serving in the army, he entered a music college, from which he graduated with a major in guitar. Later on, he and his guitar headed to the Jewish Autonomous Region (Oblast’). More than a century ago, the founding fathers of Holy Dormition parish came here, to southwest Pennsylvania, leaving behind everything that was near and dear to them: their homes, families, and customs. They knew that, without hope in God’s providence, they would not survive. And out of this great faith, fidelity toward and love for God, in 1917 these people founded an Orthodox parish. An icon of the Protection of the Most Holy Theotokos containing a piece of the omophorion of the Mother of God is visiting the churches and monasteries of the Eastern American Diocese. Brining the icon from Moscow is the general director of the Russian National Creative Workshop "Art-Project," LLC, and director of the International Foundation for Mutual Development & Strengthening of Spiritual Unity and the Religious & Historical Values of Russian Orthodoxy in the Homeland & Abroad "Under the Protection of the Theotokos," Eugene (Evgeny) Korolev. Mr. Korolev first visited the Diocese in December 2015, when a monument to the Reunification of the Russian Orthodox Church was dedicated at the Diocesan Center in Howell, NJ. Russian Church life in Florida was begun by Archbishop Vitaly (Maximenko) in 1937 – who was himself later appointed Bishop of Florida – in a big city in the south of the state. In the mid-1940s, construction began on the first Russian church in Florida. Its founders were from the first and second waves of immigrants and included seven dwarfs – professional performers, who arrived in Miami at World War II broke out. Among them were Ivan and Pelagia Velikanov, and Vasily and Maria Filin. Their names appear on a memorial plaque at the entrance to the church. On Sunday, October 15, Matushka Martha Ermakov, of McKeesport, PA, reposed in the Lord. She was 88. She was born August 23, 1929 in Olyphant, PA (near Scranton) and was the daughter of the late John and Martha Russen Sweda. She was the wife of the late Archpriest Dimitri H. Ermakov. In our age of technology, our enemies want us to feel down and upset, but we can’t let them do that. We must be joyful and happy. I’m no priest or deacon, but I know that God wants all of us to be happy. He doesn’t want anything to stand in our way. When I remember Vladyka Laurus, what I remember the most important was how he truly loved the Church, how he loved the Russian Church, and how he was always measured in all things... Vladyka taught by example or by his short words or comments ("short" meaning concise: he did not have to say too much to guide us). On Tuesday, August 29, 2017, the feast of the Holy Image of the Savior "Not Made by Hands," the Eastern American Diocese prayerfully marked the 40th anniversary of the repose of Archpriest Peter Motscharsky (long-time rector of Holy Trinity Church in Astoria, NY). In honor of this anniversary, the diocesan Media Office would like to offer our readers the eulogy spoken at Fr. Peter’s funeral, delivered by his son-in-law, Protopresbyter Valery Lukianov, and translated into English for the first time. Archpriest Victor Potapov is a cleric of the Russian Orthodox Church Outside of Russia, rector of St. John the Baptist Cathedral in Washington, DC, is well-known not only in the United States, but in Russia, as well. For over 30 years, he led spiritual broadcasts on "Voice of America" radio. On August 21, 1987, longtime cell attendant to Metropolitan Philaret (Voznesensky) of Eastern America & New York, Protodeacon Nikita Chakirov, reposed in the Lord. In honor of the 30th anniversary of the repose of this zealous laborer of the Eastern American Diocese, we offer our readers an article written in memory of Fr. Nikita by Matushka Irina Lukianov (Boston, MA). On Sunday, August 13, 1967, on the eve of the Dormition Fast, the Synodal Cathedral of the Sign in New York City hosted the hierarchal consecration of the dean of students of Holy Trinity Seminary in Jordanville, NY - Archimandrite Laurus (Škurla) - as Bishop of Manhattan, with an assignment to the position of secretary of the Synod of Bishops of the Russian Orthodox Church Outside of Russia and vicar to her First Hierarch, Metropolitan Philaret of Eastern America & New York. Metropolitan Philaret led the consecration, joined by a multitude of hierarchs and clergy. With the blessing of His Eminence, Metropolitan Hilarion, Archimandrite Maximos (Weimar), abbot of the Brotherhood of the Holy Cross, presently located in East Setauket, NY, announced that the Brotherhood will be leaving its current location to establish the Brotherhood of the Holy Hieromartyr Dionysios the Areopagite. Until 2010, the monastery was under the omophorion of the Jerusalem Patriarchate, and is now under the canonical authority of Metropolitan Hilarion, First Hierarch of the Russian Church Abroad. Recently, the Brotherhood faced a difficult decision; by choosing to remain within the Russian Orthodox Church Outside of Russia, a change of residence is now necessary. When "Yura" started kindergarten, he knew only three phrases in English, which was not rare for the families of Russian émigrés, who tried to delay the assimilation of their children. Even today, you will find Americans who speak flawless Russian. Long Island was home to one of the many post-WWII Russian communities which pooled their money one penny at a time to build their own modest churches in neighborhoods with large mansions, among which are St. Seraphim and Holy Intercession Churches.